In a recent interview, Mr. Miyamoto confirmed that a new Pikmin game will be shown at the E3 Expo in June. 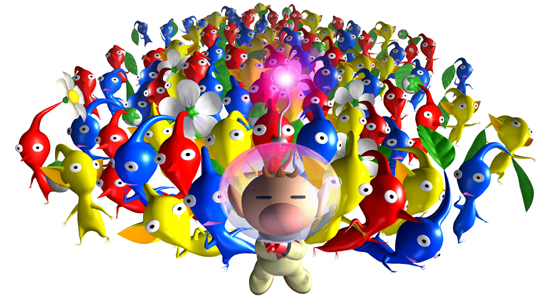 He believes that anyone who has played Pikmin games in the past will enjoy playing. This confirmation is big news for Pikmin fans who have waited eight years for the next installment in the series. Mr. Miyamoto also confirmed that a new Super Mario Bros. game for the Wii U system will be shown at this year’s E3 Expo. This is based on the Mario experience that was demonstrated at last year’s E3 Expo. We’ll have more to announce about our plans for the E3 Expo at a later date. No specific details are given, but if you liked the New Super Mario Bros. Mii demo shown last year, chances are you’ll enjoy this year’s Super Mario Bros. Wii U presentation as well. This is great news. I’m excited for Pikimin, and more upcoming games for the Wii U.
I’m calling it. Pikmin 3 will a achieve a “claymation” visual on Wii U.
I’m looking forward to Pikmin but I don’t really care for the Super Mario Bros. game, the thing I care most about from last years E3 is the Zelda demo. Nintendo get cracking on it please. This has been so long coming, Pikmin is such a good game, can’t wait to see it return! The rumor as it stands now is that the Mario game for Wii U is the old tech demo New Super Mario Bros. Mii.